Ski jumper Ryoyu Kobayashi said he was “surprised” to be greeted by so many television cameras and reporters at Haneda airport on Tuesday as he returned home midway through his remarkable breakout season. Kobayashi has won nine events on the World Cup circuit this season, including becoming the third man in history to pull off a grand slam at the prestigious Four Hills Tournament in Germany and Austria earlier this month. The 22-year-old said his most impressive moment this season was his 137.5-meter second and final jump in Bischofshofen, Austria, on Jan. 6, which allowed him to vault three places into the lead and claim his fifth straight win, along with a page in the history books. He returned home with compatriots Yukiya Sato, who finished third in Poland on Sunday and stood on the World Cup podium for the first time, and veteran jumper Noriaki Kasai, who oversees athletes at the sponsor he and Kobayashi share. Kobayashi said competing with and getting advice from Kasai has helped him remain calm under pressure. “He relieves my tension,” Kobayashi said of Kasai, an eight-time Winter Olympian. “That’s why I look forward to competitions. I’m extremely grateful. The overall World Cup leader said he hopes to put on another impressive display this weekend at the next two men’s events taking place in Sapporo. “People are going to be expecting it, so I hope I can deliver a big jump,” he said. Despite missing out on becoming the first ski jumper ever to win seven consecutive World Cup events, Kobayashi has landed on the podium in 11 of 14 competitions this season and leads Poland’s Kamil Stoch by over 500 points in the standings. The Iwate Prefecture native brushed off back-to-back seventh-place results at the last two individual events, saying he “isn’t able to focus well sometimes” but is still confident he can consistently place within the top 10 for the remainder of the season. 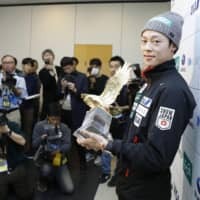 Kobayashi said he has grown since making his Olympic debut last February, when he placed seventh in the normal hill and 10th in the large hill at the Pyeongchang Winter Games. When asked if he was thinking about becoming the first Japanese man to claim an overall championship, Kobayashi said he hopes to take advantage of the opportunity he made in the first half of the season.